Home » Is Russia’s “Deep State” Divided Over India? Russian diplomacy in the 21st century is characterized by its trademarked balancing and mutually beneficial pragmatism. This pair of traits is difficult enough for any power to practice individually and is extra challenging to do so concurrently with the other, though Russia masterfully manages to pull this off because of its “deep state’s” consensus on the country’s grand strategic purpose in Eurasia. To avoid any misunderstandings, the “deep state” that’s being referred to is the permanent military, intelligence, and diplomatic bureaucracies that ensure long-term political stability for the state, and in Russia’s case, they’re in complete agreement about the need for Moscow to balance the various, and often times competing, forces in the supercontinent in order to maintain peaceful harmony between them. Whether it’s through military diplomacy or traditional statecraft, Russia is working hard to defuse the state-on-state tension that the US has stoked all throughout Eurasia. The world has borne witness to just how quickly Russia’s direct involvement in the Mideast totally rewrote the rules of the game in that region, just as it stands to do in East Asia as Moscow and Tokyo edge closer to signing a conclusive peace treaty with one another and resolving the “Kuril Islands dispute”. The strategic situation in Europe has reached a stalemate between Russia and the US/NATO, while events in the Arctic haven’t yet dynamically begun to develop and won’t do so until after more of the ice melts sometime in the coming future, so the only Rimland portion of Eurasia still unaccounted for by Russia’s pan-continental balancing act is South Asia, which has only recently come to the fore of Moscow’s attention in this regard. 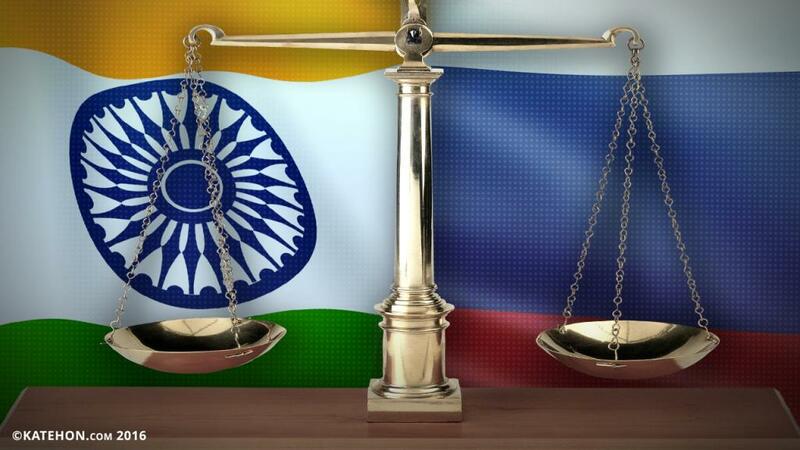 Russia enjoyed decades of fruitful friendship with India during the halcyon days of the Old Cold War, though the relationship notably weakened in intensity during the 1990s and 2000s, taking aside the unchanging constant of Russia being India’s main arms supplier. It was only in the past couple of years through the BRICS platform that Russia and India came closer together in other spheres such as the economic and investment ones, and they’re now planning to participate in the North-South Transport Corridor which aims to connect South Asian and Western European markets by means of overland routes stretching through Iran, Azerbaijan, and Russia. Some commentators gleefully proclaimed the beginning of a renaissance in these two long-standing partners’ relationship, but such a belief is naively premature and doesn’t take into account the fact that Moscow is no longer New Delhi’s main international partner. The US began persistently courting India in the 1980s but didn’t start to tangibly succeed in its efforts until the election of Hindutva nationalist Narendra Modi, who was more than eager to throw India’s hat in the US’ ‘China Containment Coalition’ ring. Within the course of not even two and a half years, the same man who had at one time been sanctioned by Washington with a travel ban turned into its strongest proponent in Eurasia, committing his nominally “non-aligned” country to an unprecedented military-strategic partnership with the US. The geostrategic shift that this produced will have a profound and lasting legacy all across Eurasia, and it speaks to the fact that the international situation is markedly different in the New Cold War than it was during the old one. It might have been with an eye on this predictable eventuality that Russia lifted its arms embargo on Pakistan in 2014 and rapidly moved to enter into an historic rapprochement with it, eager to also reap the benefits of Pakistan’s pivotal role as the zipper of pan-Eurasian integration in a 21st century increasingly defined by infrastructure connectivity prospects and New Silk Roads. Up until the mid-September Uri Attack, Russia’s balancing act in South Asia was progressing without a hitch, and Moscow was masterfully handling both complementary vectors of its regional policy without developing any contradictions between them. The enthusiastic embrace of economic relations with India wasn’t harmed by the interest that Moscow had in selling weapons to Islamabad and conducting joint anti-terrorist operations with New Delhi’s chief rival. Everything was moving along smoothly enough until the Uri Attack took place, which then led to a preplanned chain of events that were conditioned on forcing Russia into falling into the trap of making an unnecessary choice between its two strategic partners in the region. In fact, as the author argued in a related piece, the Uri Attack and subsequently hysterical reaction to it by New Delhi had more to do with India’s relations with its ‘fellow’ BRICS members Russia and China than it did with India’s testy ties with its arch-foe Pakistan. India exploited the occasion to rail against Pakistan during the opening week of the UN General Assembly, which coincidentally happened to occur right around this time. Additionally, India vowed to “isolate” Pakistan and condemned it as an “exporter of terrorism”. That wasn’t all, though, since India also launched its first-ever information war against Russia in seeking to get Moscow to cancel its forthcoming joint military drills with Islamabad, a clumsy and ill-thought-out attempt which miserably failed to do anything besides damage the historical friendship between the two erstwhile socialistic states. Like the author wrote in the article that was just hyperlinked above, that might have cynically been the whole point to begin with, however, since India needed an unforgettable excuse to ‘justify’ its lightning-fast strategic reorientation towards the US. Nothing could galvanize the public so strongly against Russia and undermine decades of unquestionable trust than New Delhi deliberately manipulating its citizens’ emotions in a Bollywood-like roller coaster of drama, beginning with intelligence agency-circulated lies and ending with Moscow letting down the false and unrealistically high hopes of millions of people by carrying through on its stated word in conducting prescheduled counterterrorism drills with Islamabad. President Putin’s staunch refusal to acquiesce to Modi’s craftily issued demands and irrevocably undermine Russia’s opportunity for an historic rapprochement with Pakistan predictably prompted countless articles in the jingoistic Indian ‘media’ questioning why Russia would ‘disobey’ India and wondering whether there’s even any use to continue the once-vaunted Russian-Indian friendship. The preplanned and government-prodded overreaction of the Indian jingoists succeeded in catching Russia’s attention, just as New Delhi and its Washington ally both hoped that it would. The display of anti-Russian hostility that has been incessantly showcased all across India’s mainstream media outlets is undeniable to anybody capable enough of conducting a simple keyword search on “India” and “Russia”, and there’s no doubt at this point that the Kremlin took note of the sharp turn in rhetoric coming from its South Asian ‘partner’ and was swayed by some of its “deep state” elements into undertaking urgent damage control measures in mitigating the long-term consequences. In and of itself, there’s nothing abnormal about this, and it in practice speaks to Russia’s desire to balance relations between competing sets of partners, such as how it does with Armenia and Azerbaijan, India and China, Vietnam and China, Syria and Turkey most recently, and perhaps one day even Saudi Arabia and Iran and Japan and China. What’s so special about this particular episode of Russian diplomacy is the harsh language that was used in desperately attempting to calm the social psychosis which had come to define the Indian masses’ popular attitude towards Russia in the post-Uri manipulated information landscape, and how this approach appears (operative word) to complicate the existing course of Moscow’s South Asian policy. The Ambassador was apparently in such a haste to dispel the deceitful narrative that Bollywood scriptwriters had spun in convincing millions upon millions of gullible Indians that Russia is an enabling accomplice of “terrorist-exporting” Pakistan that he didn’t bother to consider that the UN Military Observer Group in India and Pakistan discounted New Delhi’s version of events by openly stating that it “has not directly observed any firing across the LoC related to the latest incidents.” Modi also unwittingly discredited his own government by later claiming that “India has not attacked anyone” when speaking more broadly about his subjective interpretation of India’s entire post-independence history. His comments, however, were picked up in Pakistan as proof that the already suspicious “surgical strike” never happened like New Delhi narrated that it had, and that instead of commando teams sweeping across the heavily fortified Line Of Control (LOC), India just lobbed a few artillery shells and subsequently over-exaggerated what happened in order to appease the hyper-nationalist mobs that the authorities’ propaganda had produced. Regardless of what may or may not be its factual veracity, Ambassador Kadakin’s strong statement of support for India is understandable when one considers that he is one of the many Soviet-era Indophiles still working in Russia’s “deep state” apparatus. Most of the Ambassador’s career dealt with India in one capacity or another, so it’s natural that he become sympathetic to the country after his decades of service and is the premier authority on all matters related to the Russian-Indian Strategic Partnership, including the limitless benefits that this arrangement could yield for both sides if properly managed into the future. It’s for this reason why Moscow’s official top-ranking representative in the country would use such partisan language as “Pakistan-Occupied Indian state of Jammu and Kashmir” and condescendingly speak as though the Pakistani Army is a natural instrument of terrorism that’s only being restrained and guided on the path to responsible reform due to the joint military exercises with Russia. Observers shouldn’t for one minute believe that this career diplomat is necessarily expressing Moscow’s official view on the matter, but that his melodramatic statement is directed solely to the general Indian audience, which doesn’t understand any moderate language nowadays and is only receptive to extreme rhetoric. Nevertheless, Ambassador Kadakin wouldn’t have been allowed to issue such a polemical pronouncement unless he was given authority to do so by his boss, Minister of Foreign Affairs Sergey Lavrov. The Russian Foreign Minister understands the importance of his country’s weapons trade and nuclear energy cooperation with India, recognizing them as invaluable strategic gateways that might eventually lead to enhanced commercial engagement between the two countries. The tens of billions of dollars that Russia has reaped throughout the decades from these sorts of transactions, as well as the potential for even more mutually profitable trading and investment arrangements in the future, aren’t anything to be taken lightly, especially if incensed Indian diplomats were discretely threatening to take steps aimed at diminishing their country’s revenue flow to Russia in the coming years in response to Moscow’s joint counterterrorist drills with Islamabad. Faced with the predicament of potentially “losing” India, whether in general or at a quicker pace than Russia had initially forecasted, Russian Foreign Minister Lavrov did the most reasonable and responsible thing that he knew how to do, which was to order Ambassador Kadakin to issue a strongly worded statement specifically tailored to appeal to his intended audience’s expectations in order to calm the increasingly out of control hysteria that had begun to take root in India. The Indophiles aren’t the only South Asia-related faction in the Kremlin corridors, and their once-powerful influence has actually been on the decline over the past couple of years when compared to their newly ascendant rivals, the Islamophiles. This group of foreign policy experts believes that Russia must pivot towards Pakistan in order to gain access to the China-Pakistan Economic Corridor (CPEC), which could eventually reach all the way up to central Siberia and thus connect Russia’s geographic center with the global nexus of 21st-century trade in the Indian Ocean, and potentially even link this body of water with the equally strategic Arctic Ocean one day. More relevant to present-day imperatives, however, the Islamophiles envision that the formation of a solid Russian-Pakistani Strategic Partnership could also be a tremendous boost to Moscow’s efforts for bringing peace to Afghanistan. Just like how Russian Ambassador to India Alexander Kadakin is the leader of the Indophiles, Zamir Kabulov, the former Russian Ambassador to Afghanistan and current Presidential Envoy to Afghanistan & Pakistan and the head of the Ministry of Foreign Affairs’ Asia and Middle East Department is the leader of the Islamophiles. This faction gained prominence over the years as Russia sought to contain the chaos that the US created in Afghanistan and prevent it from spilling over into Central Asia. With Kabulov at the helm, they proposed that Russia and Pakistan must partner with one another in order to most efficiently bring this about, assessing that both countries are absolutely indispensable to this process and that no lasting accord could ever be achieved without their sincere and dedicated efforts being behind it. In order to arrive anywhere near this point, both sides must bravely move past their dark history of relations and reconcile with what happened during the 1980s Soviet anti-terrorist operation in Afghanistan, just like how Russia and Germany came to terms with their pasts in overcoming the much more traumatic legacy of World War II. Once both sides have come together and moved past their emotional-historical differences from that era, they can then constructively proceed with their joint vision in resolving the War on Afghanistan, with Russia managing the ‘division of labor’ that each of Afghanistan’s neighbors undertake in the their quest to bring peace to the country. To explain, the Central Asian states aren’t officially party to what’s happening south of their borders, but their ethnic nationals there have assembled into borderland militias that defensively function as a ‘firewall’ in stopping the spread of Afghan-based terrorism. Each of the three states has a unique military-strategic relationship with Russia, as Tajikistan is in the CSTO and SCO, Uzbekistan is only in the SCO, and Turkmenistan is formally ‘neutral’, all of which complicates Russia’s “Lead From Behind” role in upholding the ‘firewall’ in Northern Afghanistan. Iran, for its part, isn’t really too involved in Afghanistan’s affairs, and its purpose in the whole conflict resolution format has mainly been to silently stay on the sidelines and not interfere. Tehran is patient enough to know that its influence in the country will probably surge in the future after India’s North-South Corridor passes through the Islamic Republic’s territory en route to the landlocked state, thus making Iran one of Afghanistan’s economic lifelines. As for China, the People’s Republic has taken the lead in forging the new Quadrilateral Cooperation and Coordination Mechanism (QCCM) between itself, Tajikistan, Afghanistan, and Pakistan in containing the most likely cross-border threats between them, and Beijing is also part of the four-country Afghan Peace Talks that also involve the US and Pakistan. Concerning Pakistan, it’s obvious that Islamabad would prefer for a friendly government to take shape in Afghanistan, and it could leverage the influence of Pakistani-residing cross-border-travelling Pashtuns to this end. There’s no getting around the fact that Afghanistan’s largest ethnic group are the Pashtuns, and that there are interestingly more Pashtuns in Pakistan than in Afghanistan, so it’s absolutely impossible for Islamabad to have anything other than a front-seat position in resolving the Afghan War. Pakistan is the only actor capable of constructively influencing the relevant forces in Afghanistan and incentivizing them all to commit to peace talks, which is ever more urgent nowadays because of the spread of Daesh to the country and the disruptive effect that this will have on Afghanistan’s stability and the ongoing conflict resolution process. Aware of just how important it is that Pakistan maintains its leading role in guiding the Afghan peace process, and understanding how this directly enhances Russia’s own security interests in Central Asia, Moscow undertook the historic step of fully normalizing relations with Islamabad and moving the two sides towards a strategic partnership. Kabulov, the Russian diplomat most experienced with these intricate matters, was tasked with taking the lead in making this happen, and it’s therefore not surprising that he was also the voice that the Ministry of Foreign Affairs relied on in defending Russia’s joint antiterrorist drills with Pakistan in response to India’s heavy opposition to them. The strategy elaborated on above is reasonably sound and should in principle be sufficient for ending the Afghan War, but the problem is that the US-Indian Military-Strategic Partnership is now actively involved in undermining this process for their own ends. The US has more flexibility than India does when it comes to dealing with Afghanistan because it first and foremost is militarily occupying the country together with a scattering of allied NATO forces. Furthermore, the US also trained the Afghan military and police forces (however horribly inept they turned out to be [which could have been by design]), so it has a chance to turn a stabilized Afghanistan into center of regional unipolar influence if it had the willpower to see this vision through. It’s not to say that such a possibility would definitely succeed, but just that it does seem to have been part of Washington’s game plan from the very start. On the other hand, it can just as convincingly be argued that the US intended to turn Afghanistan into a black hole of Salafist chaos right in the center of the trans-regional pivot space of West, Central, and South Asia in order to catalyze what Brzezinski had previously taken to calling the “Eurasian Balkans”, which is essentially a divide-and-rule blueprint for geopolitically re-engineering and subsequently controlling Eurasia. One of the main problems that this Machiavellian scenario has come up against is that all of Afghanistan’s neighbors and Russia are uniting together in stopping this threat, meaning that it might not end up being as successful as the Pentagon’s strategic planners had envisioned when the first launched the war. If one sees the writing on the wall, then it’s evidently clear that the SCO – jointly led in these efforts by Russia, China, and Pakistan – will do everything in their fullest power to prevent this from happening, rightly understanding that the complete collapse of Afghanistan poses an existential threat to each of them individually and the viability of the emerging Multipolar World Order collectively. Therefore, from the American perspective, if the chaos-incubating “Eurasian Balkans” is bound to eventually be defeated in Afghanistan, then it makes the most sense to find a way to bring its new military-strategic ally on board the peace negotiation process so as to guarantee that the prospective post-conflict reconciliation government would remain as unipolar-oriented as possible. In pursuit of this modified grand strategic objective, the US is trying hard to make India an indispensable partner of the pro-American Kabul authorities, exploiting whatever tensions it can between Afghanistan and Pakistan (and Pashtuns on both sides of the border) in order to position New Delhi as the country’s preferred ‘regional’ ‘balancing’ partner, perhaps even up to the Rubicon-crossing point of inviting India to use the Pentagon’s Afghan bases as per the possibility that the recently signed LEMOA deal creates. The fruits of the US’ efforts to heighten India’s involvement in Afghan affairs have been mildly successful as of late, since the US, Afghanistan, and India commenced three-way talks last month on the sidelines of the UN General Assembly aimed at reinforcing the perception that India is now a high-level strategic partner of American-occupied Afghanistan. A touch of stereotypically dramatic Bollywood flair was added during this time when India announced that it was opening up a costly ‘air corridor’ to Afghanistan in order to get around Pakistani transit restrictions that were impeding the two-way trade of goods between New Delhi and Kabul. There’s no way that this initiative could be economically profitable, but its salience lies in the symbolism behind it and the proof that India is willing to pay a pretty penny to show Afghans its commitment to their government’s present anti-Pakistani course. As part and parcel of the Indian-Afghan relationship, Kabul sided with New Delhi when India split up SAARC by boycotting the November meeting in Islamabad. The Afghan government’s apparent submissiveness towards India is partially due to the manufactured tensions that the CIA and India’s Research and Analysis Wing (RAW, India’s version of the CIA) provoked over the years between Kabul and Islamabad, but it’s also somewhat attributable to the tempting long-term promise that India holds out to Afghanistan in one day becoming part of the North-South Corridor and thus circumventing Pakistan completely. The US’ attempts to decouple Afghanistan from Pakistan structurally mirror what it has done to devastating effect when it comes to Ukraine and Russia, with India slated to take the role of the EU when it comes to the South Asian scenario. The whole purpose behind this is to turn Afghanistan into as fervent of an enemy of Pakistan as Ukraine is to Russia today. The US knows that it could then rely on its Indian “Lead From Behind” ally to fan the flames of hate as much as possible and thus keep post-conflict Afghanistan in such a weak state of indefinite uncertainty that it’s all the easier for India to influence and turn into an outpost of unipolarity, albeit a fragile one (since a stable Afghanistan would naturally gravitate back to its historic Pakistani partner). In advancing this scenario, the US is feverishly doing everything that it can to position India for a seat at the Afghan conflict resolution table, despite this being absolutely opposed by all of Afghanistan’s neighbors who know that it would further complicate an already ultra-complex situation and lessen the chances that a real peace can ever be reached. Since the Eurasian Powers will probably never let India have any formal role in this process, the US will likely rely on its fallback plan on having India wield enough de-facto influence on Kabul alongside Washington’s own (and fully enabled by it too) that it ends up having to be brought on board to some unofficial extent or another. Having elaborating in depth on the regional strategic context that the Indophiles and Islamophiles find themselves operating in, it’s now time to return back to the research’s main focus in examining the division between these two factions and explaining the deeper differences between their respective visions for how Moscow’s policy should be conducted in the increasingly important South Eurasian Rimland. It would be ideal if a balancing solution could be brainstormed, but under the aggressive conditions of India pressuring its Russian ‘friend’ to publicly choose between itself and Pakistan, it’s unlikely that a compromise can be reached which would be acceptable to either of the two camps. India is just too hyped up with encouragement from its new American ally to ever return back to the ‘good old days’ of its former non-aligned self, seeking instead to make a big fuss out of each and every pragmatic agreement that Russia and Pakistan reach in order to discretely blackmail Moscow that it’ll dump it in favor of Washington if it doesn’t walk back whatever decision that it made. Granted, there are certain limits to how far India can go with this new policy of strategic threats, and a clear distinction must be made by seasoned diplomats between New Delhi’s Bollywood bluster and sincere statements of intent, but by and large, the Russian-Indian Strategic Partnership of decades past is nothing more than wishful nostalgia in the present day, and Russia’s Ministry of Foreign Affairs must react accordingly to this new reality. Herein lies the main shortcoming of the Indophiles. Their deeply held and long-nurtured love of all things related to India seems to have colored their judgement and blinded them from seeing the present-day situation as it objectively exists. Instead of showing shock at the unprecedentedly rapid development of the US-Indian Military-Strategic Partnership and privately condemning the Hybrid War on CPEC that’s being fought by means of Afghan terrorists and Baloch separatists, this faction of experts would rather exchange handshakes and smiles with their Indian counterparts and imagine that the magical memories of the mid-1970s Soviet-Indian Friendship are still geostrategically pertinent today. It’s always to the benefit of the multipolar world whenever Russia and India cooperate, but this mustn’t be done to the detriment of Moscow’s other Eurasian interests such as bringing peace to Afghanistan and reaffirming the globally important Russian-Chinese Strategic Partnership through Moscow’s supportive defense of CPEC. It’s not to say that Russian-Indian relations are devolving into a zero-sum game as it relates to Moscow’s other partnerships with Islamabad and Beijing, but it’s obvious that this is what both Washington and New Delhi would want to happen, no matter (or perhaps because of) how destructive this would be for pan-Eurasian multipolar integration processes. What Russia needs to do in this situation is remain firm and unwavering in the red lines that its strategists have set out for it and not bend in response to Indian pressure. Because of their adaptability in the face of India’s game-changing geostrategic pivot towards the US and their forward-thinking policy planning, the Islamophiles are distinctly at the head of Russia’s “deep state” South Asian strategy at the moment, despite the loud complaints that this elicits from the Indophiles. The fact remains that for as symbolic as Ambassador Kadakin’s statement was to the Indian press the other day about Russia’s support for Modi’s mythical “surgical strike” against Pakistan and his quips about “the Pakistan Occupied Indian state of Jammu and Kashmir” and the Pakistani Army’s inferred innate propensity for terrorism, all of this was just nothing more than words and not a single visible thing changed in the Russian-Pakistani Strategic Partnership. Russian troops still continued the joint counterterrorist drills with their Pakistani counterparts, even going as far as to train for “sabotage operations” that would ordinarily have no use against non-state actors such as terrorists but would be extremely effective against state-based military threats. The author isn’t in any way suggesting that the Russian troops are training their Pakistani partners in methods that could one day be used against India, but that the nature of terrorist threats is changing and that Moscow wants Islamabad to be properly prepared for fighting against state-like enemies such as Daesh in the future, which substantially underscores just how strong the trust is between Russia and Pakistan at this moment, irrespective of whatever the Russian Ambassador to India might publicly say in order to appease the warmongering Indian masses. All “deep states” everywhere across the world are comprised of a variety of competing factions, and Russia’s is no different. Just because certain camps are rivals doesn’t automatically mean that one is the “enemy” and the other the “patriot”. Rather, both sides could be inspired by patriotism and moved to promote the policies that they sincerely feel are the best in helping their country succeed in the world. One of the reasons why Russia’s Eurasian balancing act has been so successful is because of the sagacity that Moscow’s strategists have in incorporating various components of each patriotic faction’s ideas in order to achieve a harmonious equilibrium of policy. This same principle is at play when it comes to Russia’s position towards regional rivals India and Pakistan, though because of the fact that New Delhi is pressuring Moscow to enter into a zero-sum game as regards its arch-foe and the enormous stakes that are at play, this particular balancing act might be a lot more challenging for Russia to pull off than any other has been. In principle, nothing that Russia does should come at the expense of any of its partners’ interests, and so long as every actor that it deals with recognizes Moscow’s intent in reaching mutually beneficial outcomes in pursuit of the shared vision of a Multipolar World Order, then there isn’t any problem and everything proceeds smoothly, but as soon as ‘partners’ such as the EU and now even India begin seeing the world in a zero-sum perspective and making demands that Russia modify its sovereign policies in order to accommodate their ‘concerns’, then the whole balancing arrangement becomes at risk of falling apart. The EU was the first of Russia’s ‘partners’ to behave this way during the opening days of the New Cold War and while Kiev burned at the hands of EuroMaidan urban terrorists, and the past two years have paid testimony to just how troublesome of a policy this US-inspired move has been for Russian-EU relations. The same disastrous template is at legitimate risk of being repeated in South Asia when it comes to India, since New Delhi – egged on by the US just like Brussels was – is on the verge of fundamentally transforming the established model of Russian-Indian relations. Russia would prefer not to operate under zero-sum conditions with any of its partners, but if pressed to do so with and by India, then the Indophiles’ well-intentioned approach inadvertently becomes one of appeasement to blackmail at the expense of positive relations with Pakistan and potential progress on reaching a solution to the Afghan War. The Islamophiles, on the other hand, are much better attuned for dealing with India in the zero-sum reality that New Delhi’s American ally is forcing upon both of them, and if India is indeed planning to ‘dump’ Russia from its previous position as the country’s ‘privileged partner’, then Russia might as well prepare for this eventuality and not unnecessarily lose any gains vis-à-vis Pakistan and Afghanistan in the process like it would if it adhered to the Indophiles’ inflexible and backwards-looking strategy during these changed times. If forced to choose, it’s better for Russia to pursue its Pakistani policy because of the immediate importance that the stabilization of Afghanistan would have for Russia’s southern-vectored security and the long-term benefits that this would have for connecting Siberia to CPEC. Moreover, there are definite limits to how far and fast India can decouple itself from Russia, no matter how mutually disadvantageous this would be. Russia’s military and nuclear energy interests in India are so deeply entrenched that they can’t feasibly be rooted out in the short-term no matter how vehemently Modi may try even if the relationship suddenly turned real sour and the US ordered him to do so. On top of that, both Russia and India have their own self-interested reasons for cooperating on the North-South Corridor, so it’s unrealistic for this trans-Eurasian megaproject to fall victim to even the worst deterioration of bilateral relations. If the Indians want to make Russia just “another Great Power among many”, then Moscow really doesn’t have all that much to lose, since it’s already not receiving any preferential treatment compared to the US or Japan when it comes to infrastructure development and other projects inside of India. However, by continuing to entertain the Indophile faction, Russia stands to lose all of the promising strategic-security achievements that it’s reached with Pakistan and Afghanistan thus far, though the opposite economic variant isn’t possible with the Islamophiles towards India since the gains can’t be lost so quickly (if ever at all). India will probably continue to blow off jingoistic steam and discretely blackmail Russia from here on out, but Moscow must not cave in to the Indophiles and reverse the course that the Islamophiles have charted for it. There’s only so much that India can do to ‘punish’ Russia, and most of it is just bluster anyhow since Moscow isn’t even enjoying the same type of commercial benefits as its rivals presently are in India’s domestic economy. While it’s true that Russia could profit through the future promulgation of some sort of preferential economic agreement with India, this wouldn’t be too qualitatively different from the benefits that it will already reap through the North-South Corridor, which in fact might even prompt such a deal out of the mutually self-interested considerations of both sides regardless of whatever the state of their bilateral political relations might be by that time. Relatedly, Russia would then be able to harness the fruits of both the North-South Corridor and CPEC since it wouldn’t be sacrificing the latter for nothing. From the reverse perspective and unlike the potential gains that it could continue to receive from India, Russia would be unable to recoup any strategic-security losses that it incurs relative to Pakistan and Afghanistan if it doesn’t maintain its Islamophile policy in South Asia, which should be a convincing reason enough to stay the course and balance against the US’ new Indian ally.